Aim: To systematically review the anesthetic success rates of inferior alveolar nerve block (IANB) injection technique alone with that of combination of IANB and supplemental infiltration (SI) technique when used for pulpal anesthesia of mandibular posterior teeth with irreversible pulpitis during endodontic treatment. Settings and Design: The study follows a longitudinal study design involving original research. Materials and Methods: Electronic databases were systematically searched for randomized controlled clinical studies. Studies were selected by predefined inclusion and exclusion criteria. Statistical Analysis Used and Result: The statistical analysis used was based on the results of the original research. All the included studies showed that there is the difference in the values comparing the two techniques, but the data are not statistically significantly different. Conclusion: Based on this review, the better anesthetic efficacy of the SI was observed. Aim: To investigate the fracture resistance of restored endodontically treated teeth (RETT) with fiber posts, cores, and crowns with limited ferrules. Materials and Methods: Sixty maxillary anterior teeth were endodontically treated and decoronated 2 mm above the cemento-enamel junction, and then divided into 6 groups of 10 teeth each; Group circumferential ferrule (2FR), Group ferrule in the labial, mesial, and palatal region (2FR-LaMPa), Group ferrule in the labial, and palatal region (2FR-LaPa), Group 2FR-Pa and 2FR-La respectively, and Group 0FR (no ferrule). All 60 prepared teeth were then restored with quartz fiber posts, resin composite cores, and metal crowns. The specimens were subjected to load until failure occurred. Data were analyzed using one-way analysis of variance and Tukey's tests (α = 0.05). The mode of failure was determined under a stereoscope. Results: A statistical significant difference was found among groups 2FR-LaMPa, 2FR-Pa, 2FR-LaPa, and 2FR from the group 2FR-La, and from the group 0FR (P < 0.01). The predominant mode of failure was an oblique palatal to labial root fracture for the groups with remaining ferrules. Conclusion: For RETT that have incomplete crown ferrules, the location of the ferrules may affect their fracture resistance. Aim: The aim was to evaluate the effect of sugar-free chewing gum containing casein phosphopeptide-amorphous calcium phosphate (CPP-ACP) and xylitol on salivary Streptococcus mutans. Materials and Methods: A total of 60 dental students of 20-25 years old, who volunteered after checking their health condition and signing an informed consent, were randomly allocated to receive one of the following interventions: (A) Chewing gum containing CPP-ACP; (B) containing xylitol. Subjects within the experimental groups were taken the gums 3 times daily, after each meal for a period of 3 weeks. Pre- and post-intervention unstimulated saliva samples were quantified for S. mutans counts. Results: A statistically significant reduction of salivary S. mutans was displayed in both groups A and B after the intervention when compared with baseline (P < 0.001), and group A shows more statistically significant reduction of salivary S. mutans than group B (P = 0.011). Conclusion: Daily consumption of chewing gum containing CPP-ACP and xylitol significantly reduces the level of salivary S. mutans, but chewing gum containing CPP-ACP can reduce the level of salivary S. mutans in more than xylitol chewing gum. Aims: Adequate bone support is an essential factor to avoid undue stress to the tooth. This is important when the tooth is endodontically treated and requires a post. The purpose of the present finite element (FE) analysis study was to evaluate the stress distribution of post on endodontically treated tooth with reduced alveolar bone height support and after bone augmentation. The null hypothesis was that there is no difference between the stress distribution of post on endodontically treated teeth with reduced alveolar bone height support and after alveolar bone height augmented using bone graft substitute. Materials and Methods: The three-dimensional model was fabricated using ANSYS Workbench version 13.0 software to represent an endodontically treated mandibular second premolar restored with a full ceramic crown restoration and was analyzed using FE analysis. A load of 300N at an angle of 60° to the vertical was applied to the triangular ridge of the buccal cusp in a buccolingual plane. The stresses on the tooth with normal alveolar bone height, reduced alveolar bone height, and after bone augmentation because of reduced bone height were calculated using von misses stresses. 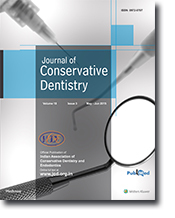 Results: A maximum stress value of 136.04 MPa was observed in dentin with an alveolar bone height of 4 mm from the cemento-enamel junction (CEJ). However, after 2 mm of alveolar bone augmentation, the stress value was 104.32 MPa, which was comparable to the stress value of 105.56 observed with the normal bone height of 2 mm from the CEJ. Conclusion: Similar values of stresses were observed in teeth with normal and augmented bone height. Increased stresses were observed with alveolar bone loss of 4 mm from the CEJ. Context: The self-adjusting file (SAFs) is reported to be resistant to file separation in laboratory tests. No information is currently available regarding SAF separation during clinical use. Aim: To conduct preliminary clinical survey among experienced SAF users in order to establish the prevalence of SAF separation during clinical use and to study how were such cases treated. Materials and Methods: A questionnaire was sent to experienced SAF users to make inquiries regarding incidence of SAF separation and how were such events treated. Only responses from operators who had used 50 SAFs or more were included in the present study. Fisher's exact test was used to compare file separation occurrence. Results: A total of 2517 SAFs had been used by these operators, and 15 cases of file separation were reported (0.6%). Twelve of these 15 separated files could be retrieved within a few minutes using Hedstrφm files, with no additional dentine removal required. In the three cases in which the separated files could not be retrieved, the separated file segment was successfully bypassed. Conclusions: The SAF might separate during clinical use, but the incidence of such an event was low. In most such cases, the separated file segment was easily and quickly retrieved without additional removal of dentin. Background: Long-term use of intracanal medicaments such as calcium hydroxide (CH) reduces the fracture resistance of dentin. The present study was undertaken to evaluate the fracture resistance of radicular dentin on long-term use of CH, chlorhexidine (CHX) with lycopene (LP). Aim: To compare the fracture resistance of radicular dentin when intracanal medicaments such as CH, CHX with LP were used for 1-week and 1-month time interval. Settings and Design: Sixty single-rooted extracted human permanent premolars were collected, and complete instrumentation was done. Samples were divided into three groups based on intracanal medicament used. Materials and Methods: Group 1 - no medicament was placed (CON), group 2 - mixture of 1.5 g of CH and 1 ml of 2% CHX (CHCHX), group 3 - mixture of 1.5 g of CH, 1 ml of CHX and 1 ml of 5% LP solution (CHCHXLP). After storage period of each group for 1-week and 1-month, middle 8 mm root cylinder was sectioned and tested for fracture resistance. Statistical Analysis: Results were analyzed using paired t-test. Results: At 1-month time interval, there was a statistically significant difference in fracture resistance between CHCHX and CHCHXLP groups. Conclusion: Addition of LP has not decreased the fracture resistance of radicular dentin after 1-month. Introduction: The objective of this study was to evaluate dentinal defects formed by new rotary system - Protaper next TM (PTN). Materials and Methods: Sixty single-rooted premolars were selected. All specimens were decoronated and divided into four groups, each group having 15 specimens. Group I specimens were prepared by Hand K-files (Mani), Group II with ProTaper Universal (PT; Dentsply Maillefer), Group III with Hero Shaper (HS; Micro-Mega, Besancon, France), and Group IV with PTN (Dentsply Maillefer). Roots of each specimen were sectioned at 3, 6, and 9mm from the apex and were then viewed under a stereomicroscope to evaluate presence or absence of dentinal defects. Results: In roots prepared with hand files (HFs) showed lowest percentage of dentinal defects (6.7%); whereas in roots prepared with PT, HS, and PTN it was 40, 66.7, and 26.7%, respectively. There was significant difference between the HS group and the PTN group (P < 0.05). Conclusion: All rotary files induced defects in root dentin, whereas the hand instruments induced minimal defects. Aim: The aim was to evaluate the influence of different crosshead speeds on diametral tensile strength (DTS) of a resin composite material (Tetric N-Ceram). Materials and Methods: The DTS of Tetric N-Ceram was evaluated using four different crosshead speeds 0.5 mm/min (DTS 1), 1 mm/min (DTS 2), 5 mm/min (DTS 3), 10 mm/min (DTS 4). A total of 48 specimens were prepared and divided into four subgroups with 12 specimens in each group. Specimens were made using stainless steel split custom molds of dimensions 6 mm diameter and 3 mm height. The specimens were stored in distilled water at room temperature for 24 h. Universal testing machine was used and DTS values were calculated in MPa. Results: Analysis of variance was used to compare the four groups. Higher mean DTS value was recorded in DTS 2 followed by DTS 4, DTS 1, and DTS 3, respectively. However, the difference in mean tensile strength between the groups was not statistically significant (P > 0.05). Conclusion: The crosshead speed variation between 0.5 and 10 mm/min does not seem to influence the DTS of a resin composite. EGCG at the studied concentrations were not effective in eliminating S. mutans from dentin caries-like lesions. Objective: The aim of the study is to evaluate temperature change in fiber-reinforced composite (FRC) resin photopolymerized with a light-emitting diode (LED) light-curing unit (LCU). Materials and Methods: Forty dentine disks (1 mm thick and 8 mm diameter) were prepared from human molars. The FRC specimens (2 mm thickness and 8 mm diameter) consisted of polyethylene fiber (Construct (CT)) products or glass fiber (ever Stick (ES)) and one hybrid composite bonded to the dentin disks and polymerized with an LED LCU. Control groups were prepared using the hybrid composite. Temperature rise in dentine samples under the FRC bonded disks was measured using a K-type thermocouple, and data were recorded. Temperature change data were subjected to analysis of variance (ANOVA) and Duncan's test. Results: The results show that addition of fiber (one or two layers) did not change temperature rise values at any of the exposure times (P > 0.05). The CT fiber/two layer/40 s group exhibited the greatest temperature rise (5.49 ± 0.62) and the ES/one layer/10 s group the lowest rise (1.75 ± 0.32). A significant difference was observed in temperature rise measured during 10 and 20 s exposures (P < 0.05). Conclusion: Maximal temperature rise determined in all groups was not critical for pulpal health, although clinicians need to note temperature rises during polymerization. Aim: To evaluate influence of three different filler particles on an experimental Bisphenol A ethoxylated dimethacrylate (Bis-EMA) based root filling material. Materials and Methods: Resin-based endodontic sealers were produced using Bis-EMA, camphorquinone, ethyl 4-dimethylaminobenzoate (EDAB), N, N-dihydroxyethyl-p-toluidine (DHEPT), butylated hydroxytoluene (BHT), and benzoyl peroxide. The experimental groups were formulated adding 10, 20, 30, 40, and 50% of calcium tungstate (CaWO 4 ), ytterbium trifluoride(YbF 3 ), and tantalum oxide(Ta 2 O 5 ). Flow, thickness, and radiopacity tests were conducted in accordance with ISO 6876. Sorption and solubility (SL) tests were conducted in accordance with ISO 4049, pH was measured with a pH meter, and degree of conversion (DC) was evaluated with Fourier transform infrared spectroscopy (FTIR). For radiopacity, two-way analysis of variance (ANOVA) and Tukey's multiple comparison test was performed. For DC analysis, one-way ANOVA and Tukey's multiple comparison test was performed. All statistical analyses were performed with a significance level of 5%. Results: All groups showed lower flow with increased filler concentration. All groups showed film thickness values lower than 50μm, as ISO recommends, except CaWO 4 50% group (76.7μm). pH values varied from 5.95 (± 0.07) in YbF 3 40% group to 6.90 (± 0.07) in Ta 2 O 5 40% group. In the radiopacity test, YbF 3 30%, Ta 2 O 5 40%, and Ta 2 O 5 50% groups showed no statistical significant difference to 3mmAl. 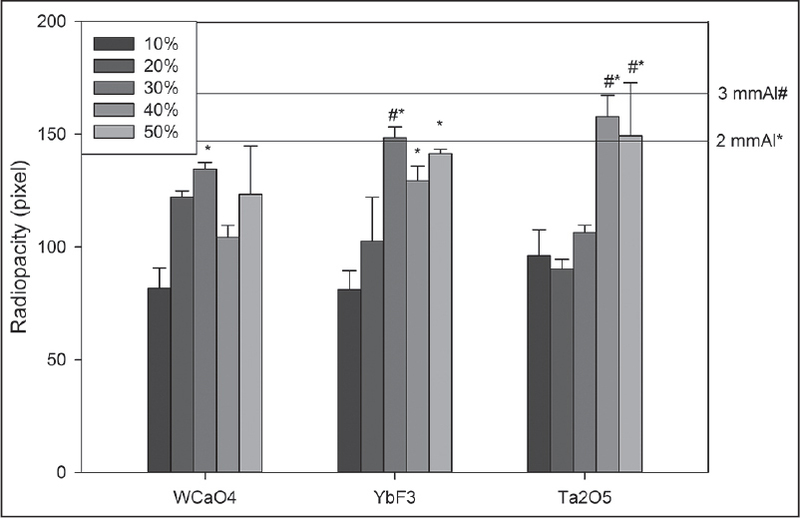 Ta 2 O 5 and YbF 3 groups in 10, 20, and 30% concentrations presented sorption and SL values as ISOrecommendation. Addition ofTa 2 O 5 and CaWO 4 decreased DC after 14 days. YbF 3 addition showed no difference in DC from control group. Conclusion: YbF 3 filler addition promoted higher properties compared to CaWO 4 and Ta 2 O 5 on Bis-EMA based root canal sealer. Aims: This study examined the setting time, compressive strength, and pH of white mineral trioxide aggregate (MTA) mixed with various additives: Calcium chloride (CaCl 2 ), calcium formate (CaF), disodium hydrogen orthophosphate (Na 2 HPO 4 ). Materials and Methods: Group 1 (Control) was obtained by mixing MTA with distilled water. In Groups 2 and 3, MTA containing 10% CaCl 2 and 20% CaF, respectively, was mixed with distilled water. In Group 4, MTA was mixed with 15% Na 2 HPO 4 . Setting time, compressive strength, and pH of each group were examined. Statistical Analysis Used: Analysis was done using Statistical Package for Social Sciences (SPSS) version 14. A P-value < 0.05 was considered statistically significant. Comparison of mean values was done using analysis of variance (ANOVA) with post-hoc Games-Howell test. Results: The setting time of test groups were significantly shorter than that of control group (P < 0.001). The compressive strengths of test groups were lower than that of control group (P < 0.001). The pH value obtained for Groups 3 and 4 were higher than that of the control group (P < 0.001). Conclusions: Study result showed that additives significantly reduced the setting time of MTA and also maintained the pH at a high value. However, there was not much improvement in the compressive strength of the material. Purpose: The aim of this study was to evaluate the tensile bond strength (TBS) of repairs in recent fillings of methacrylate- (MBC) or silorane-based composites (SBC) subsequent to different surface treatments. Materials and Methods: Fifty slabs of Filtek P60 (3M ESPE, St Paul, USA) and Filtek P90 (3M ESPE) were stored for 10 days in distilled water at 37°C. The surface of adhesion was abraded with a 600-grit silicone paper and repaired using each respective composite: G1, no treatment (control); G2, application of adhesive; G3, application of silane and adhesive; G4, sandblasting (Al2O3) and adhesive; and G5, sandblasting (Al2O3), silane, and adhesive. Further 10 slabs of each composite were also evaluated for cohesive strength (G6). After 30 days immersion in distilled water at 37°C, the TBS was determined. Results: TBS results were higher for MBC than for SBC (P = 0.00012). The experimental groups were similar for SBC and the TBS was 27% of its cohesive strength. For P60, sandblasting significantly improved the TBS compared to other groups. With MBC, G4 and G5, the TBS was approximately 47% of its cohesive strength. Conclusion: Sandblasting (Al2O3) improves the repair-strength of MBC, whilst for the SBC all treatments succeed. MBC presents higher repair strength than SBC. Aim: The purpose of this study is to evaluate and compare the efficacy of 17% EDTA, 18% etidronic acid, and 7% maleic acid in smear layer removal using scanning electron microscopic image analysis. Materials and Methods: Thirty, freshly extracted mandibular premolars were used. The teeth were decoronated to obtain working length of 17mm and instrumentation up to 40 size (K file) with 2.5% NaOCl irrigation between each file. The samples were divided into Groups I (17% ethylenediaminetetraacetic acid (EDTA)), II (18% etidronic acid), and III (7% maleic acid) containing 10 samples each. Longitudinal sectioning of the samples was done. Then the samples were observed under scanning electron microscope (SEM) at apical, middle, and coronal levels. The images were scored according to the criteria: 1. No smear layer, 2. moderate smear layer, and 3 heavy smear layer. Statistical Analysis: Data was analyzed statistically using Kruskal-Wallis analysis of variance (ANOVA) followed by Mann-Whitney U test for individual comparisons. The level for significance was set at 0.05. Results: The present study showed that all the three experimental irrigants removed the smear layer from different tooth levels (coronal, middle, and apical). Final irrigation with 7% maleic acid is more efficient than 17% EDTA and 18% etidronic acid in the removal of smear layer from the apical third of root canal. Aim: The aim of the study is to compare the efficacy of different irrigation systems comparing irrigation with syringe and needle (Dispo Van), Max-I-Probe needle (Dentsply Maillefer), EndoActivator (Dentsply Maillefer), and EndoVac (Sybron Endo) in removing the smear layer generated at apical third. Materials and Methods: Instrumentation was done in 40 extracted premolars using different irrigation regimes (Group 1, saline and syringe; Group 2, Max-I-Probe needles with NaOCl and ethylenediaminetetraacetic acid (EDTA); Group 3, irrigant activation with EndoActivator using needlesNaOCl and EDTA; and Group 4, irrigation with EndoVac using needles NaOCl and EDTA). Statistical Analysis Used: The percentage of debris was seen with scanning electron microscope (SEM) and evaluated using one-way analysis of variance (ANOVA), Kruskal-Wallis test, followed by Mann-Whitney test for significance. Results: The mean score ± standard deviation for the conventional group was 2.8 ± 0.42 with median value of 3.00 (2-3). The results for the Max-I-Probe needle group were 2.3 ± 0.48 with median value of 2.00 (2-3) The mean debris score for EndoActivator group were 0.8 ± 0.42 with median value of 1 (0-1). The mean debris score for EndoVac group were 0.4 ± 0.52 with median value of 1 (0-1). Conclusion: EndoVac and EndoActivator performed much better than other available systems in removing the smear layer from apical third. So they should be incorporated as a regular part of the irrigation regime. Aim: Comparative assessment of fracture resistance of roots obturated with three hydrophilic systems - novel CPoint system, Resilon/Epiphany system, and EndoSequence BC sealer; and one hydrophobic gold standard gutta-percha/AHPlus system. Materials and Methods: Ninety freshly extracted, human, single-rooted mandibular premolars were selected. The specimens were decoronated and standardized to a working length of 13 mm. The teeth were randomly divided into six groups (n = 15). In Group A, teeth were left unprepared and unfilled (negative control). Rest of the groups were prepared by using ProTaper system up to a master apical file F3; followed by which Group B was left unobturated (positive control); Group C, novel CPoint System; group D, Resilon/Epiphany system, Group E EndoSequence BC sealer, and Group F gutta-percha and AH Plus. Specimens were stored for 2 weeks at 100% humidity. Each group was then subjected to fracture testing by using a universal testing machine. The force required to fracture each specimen was recorded and the data was analyzed statistically using analysis of variance (ANOVA) test and Tukey's post-hoc test. Results: The hydrophilic obturation systems have shown to exhibit significantly higher fracture resistance as shown by the values in Groups C, D, and E (P < 0.05) when compared with Group F. Within hydrophilic groups there was significant difference between Group D and Groups C and E (P < 0.05), while Groups C and E had no significant difference (P > 0.05). Conclusion: In contrast to hydrophobic systems, hydrophilic systems showed higher fracture resistance in a single-rooted premolar. Taurodontism is a developmental anomaly of a tooth characterized by large pulp chamber and short roots. Patients with multiple taurodontic teeth are associated with the probability of a systemic syndrome or chromosomal anomaly. This is the first reported incidence of the endodontic management of a hyper taurodontic mandibular second molar in a patient diagnosed with 48, XXYY syndrome. The success of an apicoectomy with a retrofilling is dependent upon obtaining an acceptable apical seal. The placement of the variously approved retrograde materials requires adequate access, visibility, lighting, and a sterile dry environment. There are instances, however, in which it is difficult to use the rubber dam. One such instance is during retrograde filling. This case report highlights an innovative technique for rubber dam isolation of root end retrograde filling.